Eagle Rider, the motorcycle experience industry leader, announces the opening of its first exclusive India location in New Delhi, enabling a new generation of Indians and tourists to explore the country with the world-renowned pioneer of motorcycle travel experiences. EagleRider India is incorporated to provide a differentiated motorcycling experience and pioneer luxury rental as a lifestyle among the motorcycle enthusiasts in India. EagleRider was launched in the year 1992 in USA and now has branches across the world. There is a growing need for luxury bike tours in India because of the number of people owning high-end motorcycles like Harley or a Triumph that cost nothing less INR 5,00,000 and move northwards. India has amazing motorable roads and is a popular tourist destination. The launch is reflective of the need for great motorcycle tours that are all about the experience of luxury. The first store of EagleRider India at New Delhi is now operational; domestic and international travellers will now be able to hire luxury motorcycles on self-drive and pre-determined guided tours or tailor-made adventure holidays within India and neighbouring countries like Nepal, Bhutan, Myanmar. The premium motorcycles can be rented on daily or longer durations and motorcycle enthusiast need not worry about the maintenance of motorcycles. 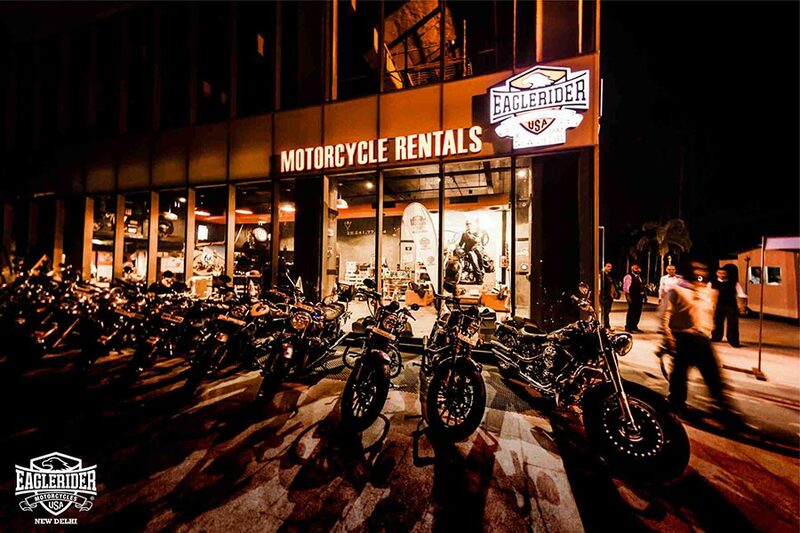 The store offers motorcycles, which includes a fleet of Harley Davidson, Triumph and Royal Enfield’s. We all know that riding motorcycles is fun. But riding a motorcycle as you explore a legendary country like India with so much history in every mile and so many interesting things to see and do is an entirely unique and unforgettable experience. EagleRider is immensely proud to finally be able to make that experience a possibility for fellow riders across the World. The new location—which is conveniently located near the airport—offers tours tailored to all desires with luxurious hotel choices all over India, a budding fleet of iconic motorcycles, and the option of going with a region-specific tour guide and chase van for comfort, a spare bike, and hassle-free riding. The brand store showcases the international brand’s philosophy and the décor has been inspired by the love for motorcycles. The store features an interesting visual merchandising format and innovative product displays. The riders get a free open face DOT approved helmet. They also have the option to rent safety riding gear, cameras and GPS. For longer travel itineraries, EagleRider India staff will install saddle bags to carry luggage and if there are larger groups, a chase van to carry spares, luggage, camping gear, tech support, medical first aid, etc. will be arranged. The customers also get the choice of luxury routes and select hotels to make their stay delightful and a memorable one. EagleRider India is striving to provide a unique retail experience for the riding community. The store houses a range of high performance parts along with luggage and gear. The store has been designed not just as a usual showroom but as a meeting point for motorcycle enthusiasts and for conversations around motorcycling. Mercedes-Benz Opens New Dealership in Hyderabad - "Silver Star"